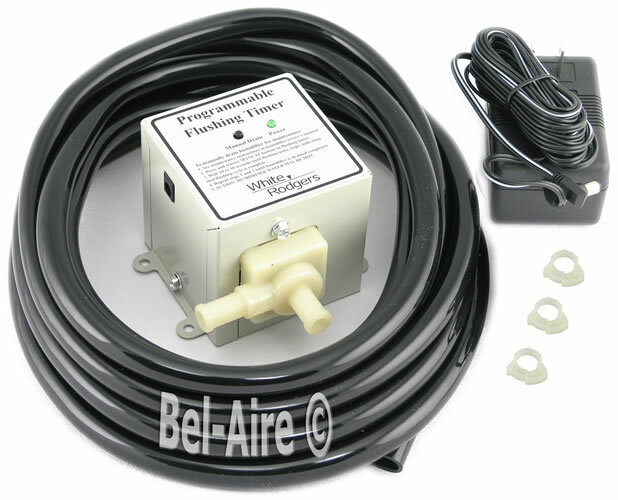 The White-Rodgers A02-0815-017 installation package includes the flushing timer, power cord with AC adapter (plugs in to a 120v outlet), 15 feet of 3/8" ID tubing, mounting hardware, installation instructions, fittings and tubing clamps for installation on White-Rodgers units, as well as on other manufacturers humidifiers. 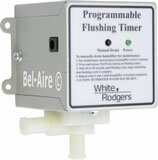 The Flushing Timer automatically flushes accumulated mineral deposits from reservoir type humidifiers. The humidifier is drained every 12 hours, for a duration of 10, 20, or 30 seconds. The 10-30 second duration is set by dip switches. The flushing timer simply opens the drain allowing the old water to run out while the humidifier float allows fresh water to pour. After 10, 20 or 30 seconds the drain is closed and the reservoir is allowed to refill. Same as the Skuttle 00S-HAFT-000.